Skipper cares about the health and fitness of its employees and believe that “A healthy body leads to a healthy mind.”. The Company pledged support to Indian Prime Minister Narendra Modi’s initiative, the International Day of Yoga and joined in the worldwide celebrations of the event by organizing a yoga-themed event at its Gurgaon, India office on June 21, 2015. The event saw participation by enthusiastic Skipperites. 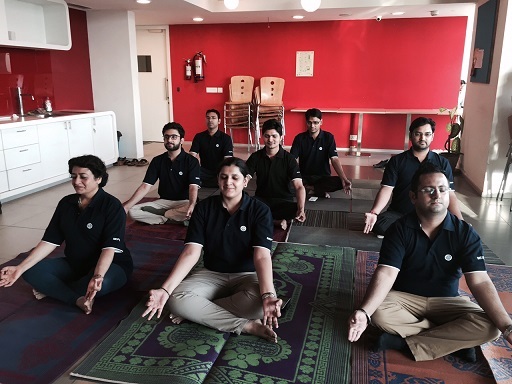 The yoga session was led by the Group Director Corporate, Ms. Poonam Sachdeva, along with other senior level executives, who performed some basic asanas (positions). Ms. Sachdeva addressed the participants after the session and spoke of the importance of doing yoga to combat stress-related diseases which are getting increasingly common in the corporate world. Further, she encouraged employees to educate their families and friends about the benefits of yoga and try to practice it everyday.